This is WOW News 247: Founder of Singapore, Lee Kuan Yew Buried Today! Founder of Singapore, Lee Kuan Yew Buried Today! Singaporeans are gathering in their thousands for the funeral of Lee Kuan Yew, the Southeast Asian city-state's founding prime minister and the man who charted its spectacular economic rise. They will be joined by a number of current and former world leaders, including former U.S. President Bill Clinton and Indian Prime Minister Narendra Modi. Lee died early Monday morning at the age of 91, prompting an outpouring of grief and tributes from around the world. He had been admitted to the hospital with pneumonia on February 5. Born in 1923, Lee co-founded Singapore, a former British colony, in 1965 when it declared its independence from Malaysia. He served as its prime minister for more than three decades, shaping the once-poor trading post into a wealthy financial center. He continued to play an important role in government until his final years. "He fought for our independence, built a nation where there was none and made us proud to be Singaporeans," Singapore Prime Minister Lee Hsien Loong, who is one of Lee's sons, said Monday. 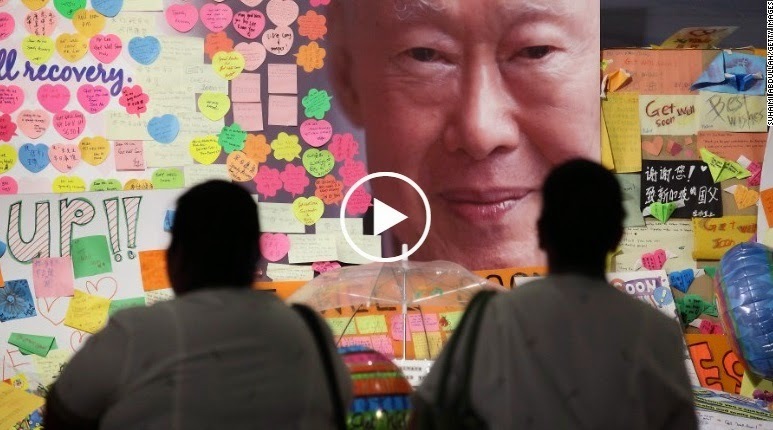 After the elder Lee's death, hundreds of thousands of people joined huge lines to pay respects to the former leader as his body lay in state at Singapore's Parliament House from Wednesday to Saturday. The 15.4 kilometer (9.6 mile) procession Sunday will snake past a number of notable Singapore landmarks on the way to the University Cultural Centre, where the state funeral service will take place. Lee's life will also be honored by a minute of silence, as well as displays by the Singapore Air Force and the Singapore Navy. His son Prime Minister Lee is among those delivering eulogies at the service, which will be followed by a private cremation. Other international figures attending the funeral include Japanese Prime Minister Shinzo Abe, Australian Prime Minister Tony Abbott, Leader of the U.K. House of Commons William Hague and former U.S. Secretary of State Henry Kissinger. Although Lee is celebrated for the economic success he helped Singapore achieve, he also drew criticism for curbing media freedoms and the treatment of political opponents. "While remembering his deeds that helped build Singapore up to what it is today, the government should also mark the passing of Lee Kuan Yew, by making a break from the politics of yesteryear that were too often marked by restrictions on basic civil and political rights," Phil Robertson, deputy director of Human Rights Watch's Asia division, said in a statement Sunday.